The first installment of my journal focused on the lovely countryside of Scotland. We also encountered lots of historic sites, and I will write a little bit about those here. 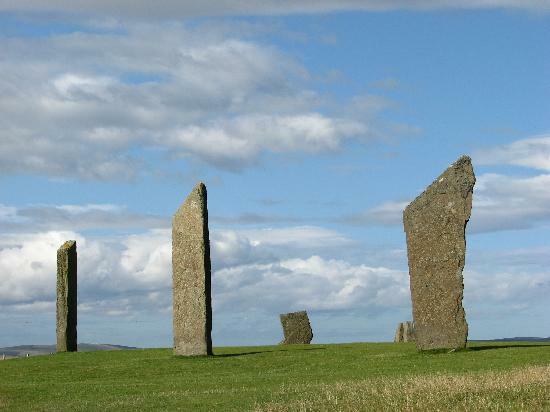 In the isles of Orkney we saw a burial tomb and standing stone rings that are more than 4000 years old. Not far away is the even older coastal village of Skara Brae (c 3200 BC). 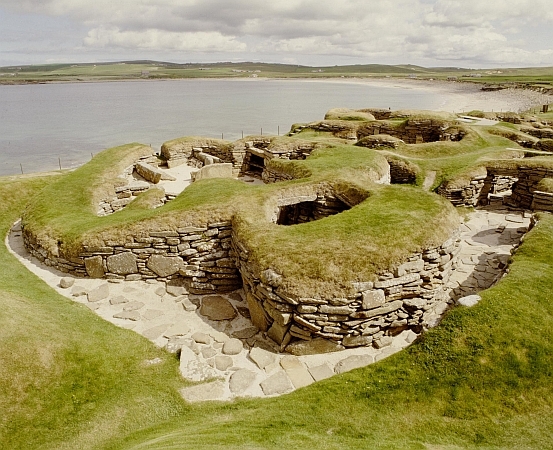 The cozy looking stone houses are older than the pyramids of Egypt (and unlike Egypt where slaves made up a good part of the population, Skara Brae was a simple egalitarian society meaning it was probably a better place to live for everyone but the Pharaoh). We also saw Pictish runes—lovely tessellations carved in stone by people the Romans considered barbarians (meaning they successfully resisted being conquered). All along the Scottish coast there is much evidence of Viking occupation such as Nordic place names. The Vikings first arrived as pillagers—the abbey at Iona was sacked several times during the 9th century—but some eventually converted to Christianity, settled in Scotland as farmers, and blended into the local population. 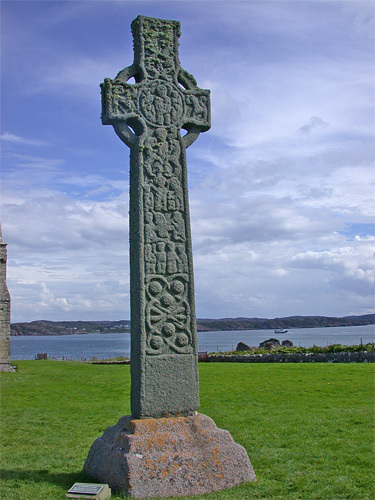 Speaking of Iona, the abbey there was founded by St. Columba in 563 AD as a place to worship and to train missionaries for the conversion of the northern British Isles, including eventually the Viking settlers. Iona is still a Christian community, nearly 1500 years after its founding, which makes it one of the longest-lived human institutions anywhere. Back on the mainland, we visited Sterling Castle which serves as the strategic gateway to the Highlands. It overlooks the site of the battle of Bannockburn where Robert the Bruce secured the independence of Scotland from England for 400 years. This year is the 700th anniversary of the battle and perhaps not coincidentally this year will also see a vote on whether to make Scotland an independent nation again. Scotland was deeply entangled in English and French dynastic politics and Mary Queen of Scots was caught between them. Her mother was French and tried to keep Scotland Catholic and pro-French. Her son James Stuart embraced Protestantism and became the king of England as well as Scotland after the death of Elizabeth. Before that, Mary herself was executed by Elizabeth to keep her from making a claim to the English throne. After a tumultuous century of Stuart rule, England turned to the German principality of Hanover for its monarchs but the Stuarts weren’t ready to give up their claim to the throne. 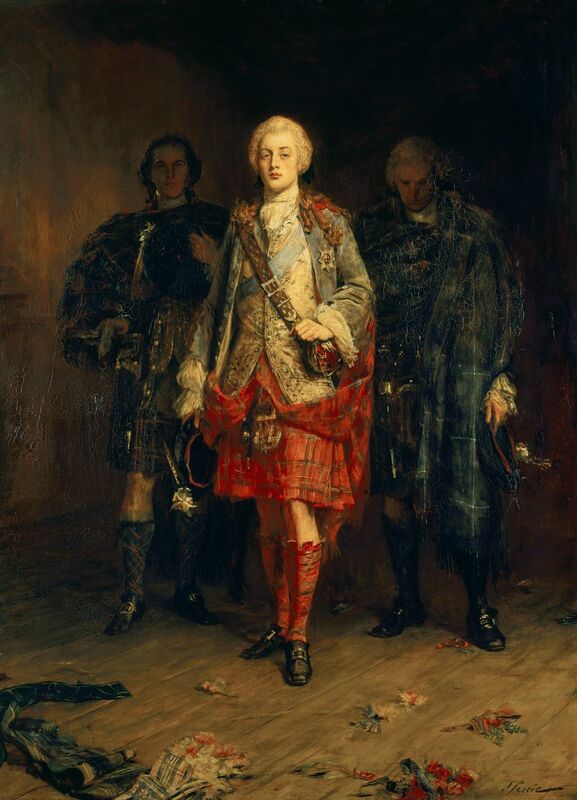 The last Stuart “pretender” was Bonnie Prince Charlie who left his place of exile in France and landed in Scotland in 1745 where he called on the highland clans to remember their old allegiance to the house of Stuart. Many clans rallied to him, but after a failed campaign to conquer England they were pursued and utterly defeated at the battle of Culloden near Inverness. Charles escaped in disguise, but his followers suffered severe reprisals. The English even banned kilts and bagpipes for a time! Shorn of all their feudal privileges, the Scottish lairds were nothing more than rich landowners. Turning their loss to profit, they began charging rents in cash and, when the poor peasants were unable to pay, they evicted them and replaced them with vast herds of sheep and cattle. Between these “clearances” and potato famines much like the more famous ones in Ireland, Scotland lost about half its population. Those who did not starve went south to the work in factories and mines or across the sea to America and Australia. Modernization was often, and in many parts of the world continues to be, a brutal process. Near Stirling we also saw a wonderful exhibit on the Scottish cattle drives of the 17th and 18th centuries that brought animals from the Highlands to lowland markets and rail heads. The business closely resembled the cattle drives in the western U.S. In fact, according to the exhibit, some of the earliest cattle drivers in the U.S. were Scottish immigrants who had herded cattle in Scotland. By the 20th century, railroads and industrial development were tying Scotland more closely to England than ever before. They shared fully in the two world wars as attested by the many monuments we saw with long lists of casualties that testify to their contributions and sufferings. Somehow through it all Scotland retains a very distinctive local character. Maybe it’s the accents (they sound a lot like the dwarves in “The Hobbit”). Maybe it’s the relative scarcity of people in the Highlands and the lovely open countryside. Whether Scotland will vote to separate from the U.K. remains to be seen but regardless, its history has left it with a wonderfully unique character. This entry was posted in Dan Miller and tagged economic development, highland cattle, history, road trip, Scotland, Scottish history, travel, UK. Bookmark the permalink.